The Fight over “Blurred Lines:” What Parts of a Song are Copyrightable? The recent court case over the song “Blurred Lines” highlighted a very thorny question: exactly what parts of a song are copyrightable? Nova Southeastern University's Copyright Officer, Stephen Carlisle, J.D., explains how courts have handled the questions legally, and how music composition techniques and music theory affect the results. This blog edition updates some topics covered in previous blog posts: Google is caught once again abusing its DMCA safe harbor rights, Canadian publisher announces a series of new James Bond stories, and a Judge rules that two copyrights that are infringed are actually only one copyright infringed. Nova Southeastern University's Copyright Officer, Stephen Carlisle, J.D., keeps you up to date and explains what it all means. Many arguments being tossed about on the internet are sheer sophistry; namely “the deliberate use of a false argument with the intent to trick someone.” Foremost amongst these are the claims of the anti-copyright forces of such curious notions that “copyrights are not property” and “copyright infringement is not theft.” Nova Southeastern University's Copyright Officer, Stephen Carlisle, J.D., examines these assertions and discovers that sometimes the answer is hiding in plain sight. James Bond Enters the Public Domain! Is This the Work of SPECTRE? James Bond has defeated many formidable villains. But now he faces the most powerful, unstoppable and implacable foe yet: the public domain! 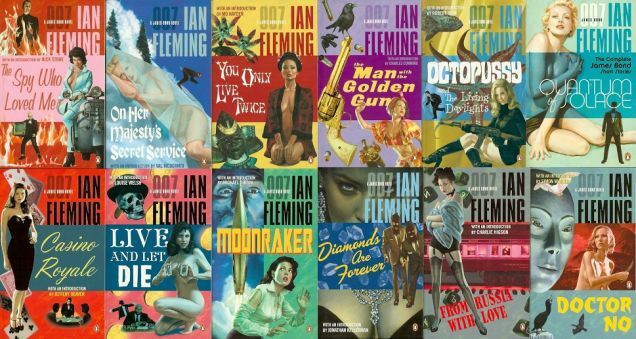 On January 1, 2015, the copyrights on the 12 James Bond novels and two collections of short stories written by Ian Fleming entered the public domain in Canada, Japan, New Zealand, South Africa, Thailand and dozens of other nations. Nova Southeastern University's Copyright Officer, Stephen Carlisle, J.D., examines what this means for our intrepid hero, now and in the future. Updating several recent blog posts, Nova Southeastern University's Copyright Officer, Stephen Carlisle, J.D., examines the options for the future of the Georgia State “fair use” litigation, how Google censors free speech when it finds it profitable to do so, and the 80% reduction in the ranks of working songwriters in Nashville. It’s been a bad few months for Sirius XM. First, they lost two cases in California brought by Flo and Eddie and the recording industry, then lost a key ruling in New York. Instead of throwing in the towel, they threw out their legal team. Unfortunately, the results got worse. Nova Southeastern University's Copyright Officer, Stephen Carlisle, J.D., examines the key points raised in the New York case, and explains why the Judge is now very unhappy. Google Blacklists 10,000 Sites a Day; Why Doesn’t It Blacklist Pirate Sites? Google likes to portray itself as a “content neutral” equivalent of an electronic golden retriever, namely that it only sends back to you what you look for. Nothing could be further from the truth. Apparently, Google has a “blacklist” and roughly 10,000 web sites a day find themselves blocked by Google, for a variety of reasons, as two recent lawsuits against Google have revealed. Nova Southeastern University's Copyright Officer, Stephen Carlisle, J.D., digs into who gets banned and why, and asks: why don’t the pirate sites get banned? Some say that streaming is the future of music. Many musicians disagree, including Taylor Swift. Not only did she refuse to place her latest album on Spotify, she pulled her entire back catalog from the streaming company, citing in part the microscopic royalty payment Spotify makes. Lots of commentators rushed out to call her greedy or stupid and sometimes both. Yet she sold over 1.2 million copies of her album “1989” in one week, which is more than anybody has sold all year long. Nova Southeastern University's Copyright Officer, Stephen Carlisle, J.D., crunches the numbers and gets to the bottom (line) of it all. In a closely watched case involving the boundaries of academic fair use, the 11th Circuit Court of Appeals weighed in with a 129 page decision that took almost a year to write. Did the decision provide institutes of higher learning with clear and effective guidance on the proper boundaries of fair use, or did it just make a gray area more opaque? Nova Southeastern University's Copyright Officer, Stephen Carlisle, J.D., analyzes the decision and where it might lead us.